FORUM WARE ist eine jährlich erscheinende Zeitschrift. Sie wird herausgegeben von der Deutschen Gesellschaft für Warenkunde und Technologie e.V. 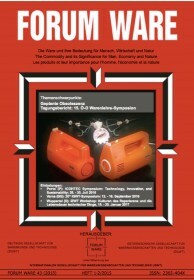 (DGWT), Karlsruhe und Wien, sowie der Österreichischen Gesellschaft für Warenwissenschaften und Technologie (ÖGWT) unter der Mitwirkung der Internationalen Gesellschaft für Warenwissenschaften und Technologie (IGWT), A-1090 Wien. FORUM WARE INTERNATIONAL is a peer-refereed journal (ISSN 1810-7028) devoted to a range of interdisciplinary fields most simply identified by the terms: Commodity, Environment, Technology, Services. It is published in an English online version between 2003 and 2012. Editors were the International Society for Commodity Science and Technology (IGWT), the German Society for Commodity Science and Technology (DGWT), and the Austrian Society for Commodity Science and Technology (ÖGWT). It addresses academics , researchers of natural, economic, social and technical sciences, stakeholders in business, industry, consumerism, research and development . The edition was managed by Eva Waginger and Gerhard Vogel, both from WU Wien, Institute of Technology and Sustainable Product Management. After the shutdown of this institute in 2012 the edition has to be frozen so far. 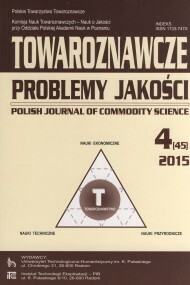 POLISH JOURNAL OF COMMODITY SCIENCE is published under the auspices of the Polish Society for Commodity Science and the Committee of Commodity Sciences - Quality Sciences of the Polish Academy of Sciences Branch in Poznan. The Quarterly is edited in the Department of Commodity Science and Quality Sciences of the Univer­sity of Technology and Humanities in Radom. The published materials are also accessible on-line which should contribute to the wider popularization of the achievements of commodity sciences not only in the scientific and economic circles but among consumers of all kinds of goods and services as well. The articles are available in Polish and English versions. Journal of Commodity Science publishes original papers in all fields of commodity science and technology of goods production. It was published from 1962 to 1977 as "Quaderni di Merceologia" and from 1978 to 1997 as "Rivista di Merceologia". Journal of Commodity Science will publish both full length and short papers reporting original research which makes a significant contribution to commodity science and technology of goods production. Review articles on themes of topical interest are welcome. 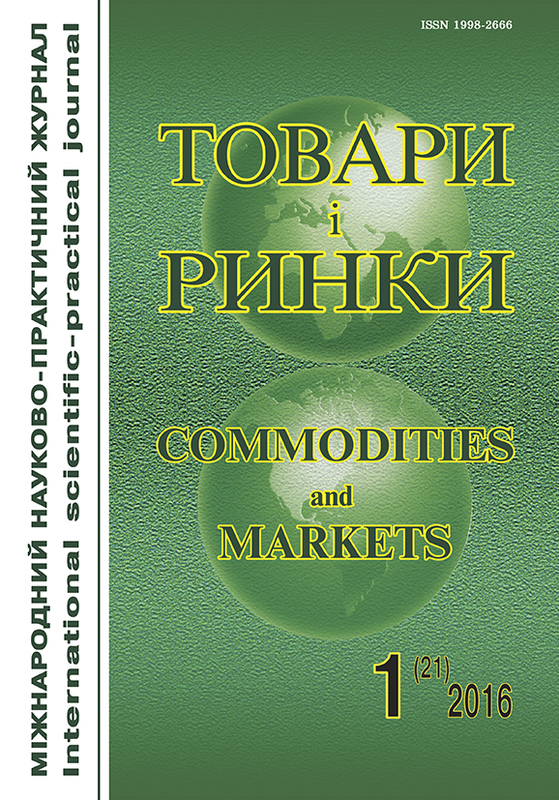 The international scientific and practical journal “Commodities and Markets” issued by Kyiv National University of Trade and Economics. The journal published twice a year and indexing in scientometric databases such as Index Copernicus (Poland), Google Scholar (USA), Research Bible (Japan), Directory of Research Journals Indexing. of commodity science, new technologies, hotel and restaurant business, marketing, merchandising, logistics, quality and safety of goods (services), standardization, metrology, certification and quality control, consumer protection. Journals accept scientific articles, which have never been published earlier and are not intended to the simultaneous publication in other editions. The volume of the article is 8–16 pages. The number of co-authors is no more than three. The articles are published in Ukrainian or English.